Expert guitar and/or theory lessons/consultation in South Yorkshire, but also worldwide via a Messenger (i.e. Skype etc.). Dimtris Kyriakidis teaches electric guitar at The University of Salford and GuitarDoncaster.com. He is also a member of the EMI Production Music UK pool of composers. He released his first single Air-Hunt in 2010, which has been getting very positive feedback from people in various countries. 2011 finds him cooperating with singer extraordinaire Goran Edman (mostly known through his collaborations with Yngwie Malmsteen and John Norum guitarist of the band Europe) on some of the material of an album that was finished in 2013, but is yet to be released. Terry Gregory (programme leader for The Institute’s BMus(Hons) Popular Music Performance) played the bass on Air Hunt. Terry has cooperated with ex-Genesis guitarist Steve Hackett, jazz virtuoso Martin Taylor and modern jazz-metal virtuoso and instructor Shaun Baxter. Dimitris composes music in which influences from several styles are frequently fused. His influences come from Greg Howe, Tony McAlpine, Yngwie Malmsteen, Michael Romeo, Joey Tafolla, George Lynch, Vinnie Moore, Joe Satriani, Steve Vai, Allan Holdsworth, TNT, Europe, Def Leppard, Van Halen, Firehouse, Dokken, Bon Jovi, Warrant, White Lion, Guns N' Roses, Iron Maiden, Pink Floyd and many more rock/heavy metal bands. Influences originate also from the field of jazz and classical music. Most important for him are Wagner, Creston, Weber, J.S. Bach, Sibelius, Saint- Saens, Piston, Barber, Tchaikovsky and Grofe just to name a few. Currently, he focuses on teaching electric guitar at the University of Salford, electric guitar and/or music theory privately through GuitarDoncaster.com, releasing his music and doing session work as guitarist. Dimitris Kyriakidis is a graduate from the Music Department of Salford University (Manchester, UK 2003), with a degree in Band Musicianship and a Master of Music in Composition from the University of Leeds (Leeds, UK 2004). He has worked for Yamaha Music School and for the Doncaster Music Service (William Appleby Music Center). 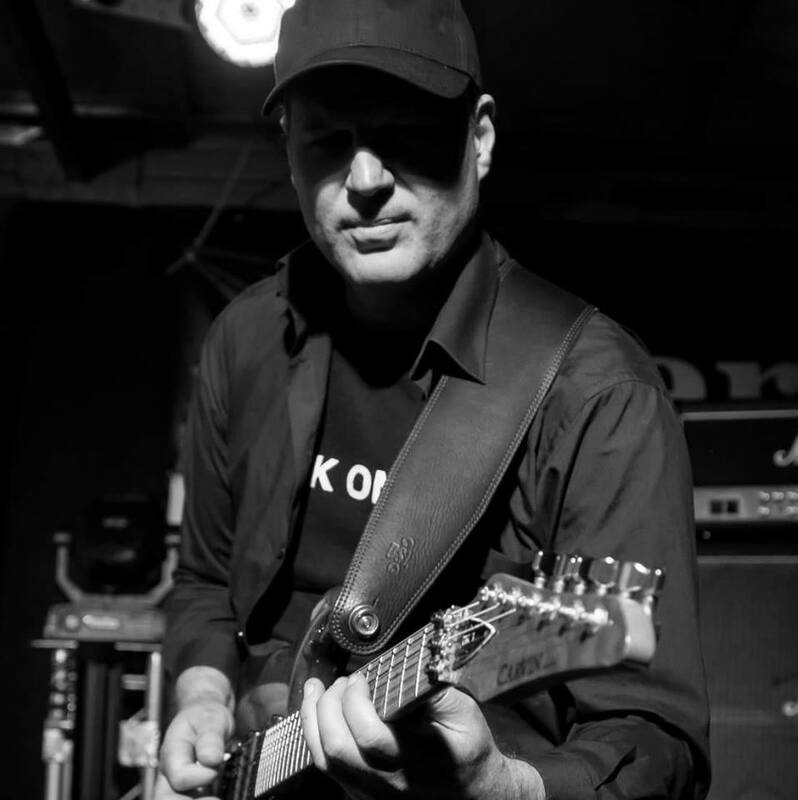 As guitarist Dimitris Kyriakidis played for various Yorkshire projects/bands. Since 2013 he occasionally collaborates as session guitarist with Paul Twohig, producer from Pro2 Studios and founder/director of EBA Records, on some of Paul's projects. In one of Pro2 Studios productions, Dimitris contributed in the recording of some guitar parts for the single Hard Road by Rebecca Bains (Onwards Records), which reached No 33 on UK iTunes Country Chart and No 29 on Greek iTunes Chart. As a member of such projects/bands he has supported The Quireboys, Marseille (featuring Neil Buchanan presenter of the TV programme Art Attack) and played at the Don Valley Bowl (Sheffield - approx. 20.000 spectators).